As mentioned earlier, cells are the smallest units of life. In complex organisms, cells group together with one another based on similar structure and function to form tissues. Tissues provide the numerous functions of organs necessary to maintain biological life. This lab exercise seeks to introduce the various tissues found in the human body and to familiarize you with their composition and function. The study of tissues is called histology and is important to the understanding of how the human body is able to function as a unit. The human body is composed of four basic types of tissues; epithelium, connective, muscular, and nervous tissues. These tissues vary in their composition and their function. A basic understanding of the role of each tissue makes understanding the specific functions easier. Now that we have an understanding of the basic roles of the tissues, we turn our focus to a more thorough investigation of the form and function of the different types of tissues in the human body. 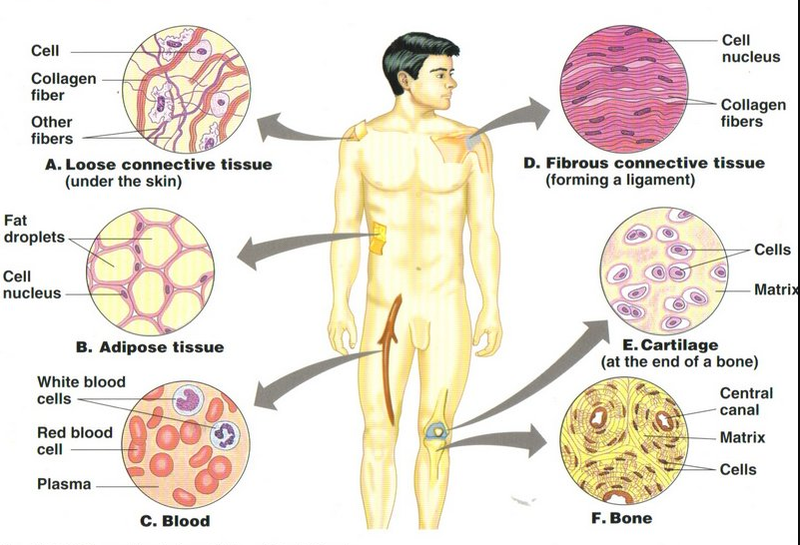 Epithelial tissue covers the whole surface of the body. It is made up of cells closely packed and ranged in one or more layers. This tissue is specialised to form the covering or lining of all internal and external body surfaces. Epithelial tissue that occurs on surfaces on the interior of the body is known as the endothelium. Epithelial cells are packed tightly together, with almost no intercellular spaces and only a small amount of intercellular substance. 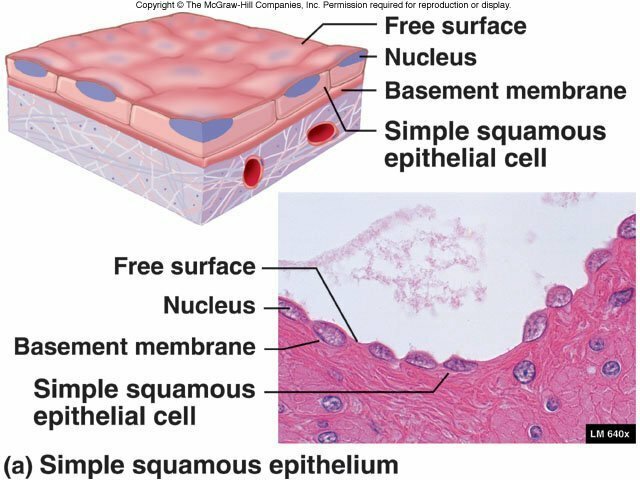 Epithelial tissue, regardless of the type, is usually separated from the underlying tissue by a thin sheet of connective tissue; basement membrane. The basement membrane provides structural support for the epithelium and also binds it to neighbour structures. Epithelial tissue can be divided into two groups depending on the number of layers of which it is composed. Epithelial tissue which is only one cell thick is known as simple epithelium. If it is two or more cells thick such as the skin, it is known as stratified epithelium. Simple epithelium can be subdivided according to the shape and function of its cells. 1. 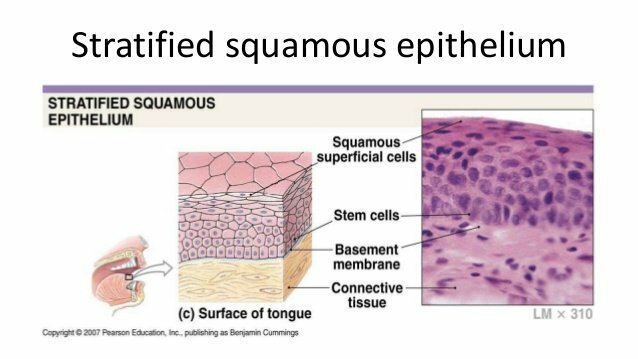 Squamous (pavement) epithelium: Squamous cells have the appearance of thin, flat plates. The shape of the nucleus usually corresponds to the cell form and help to identify the type of epithelium. Squamous cells, for example, tend to have horizontall flattened, elliptical nuclei because of the thin flattened form of the cell. They form the lining of cavities such as the mouth, blood vessels, heart and lungs and make up the outer layers of the skin. 2. 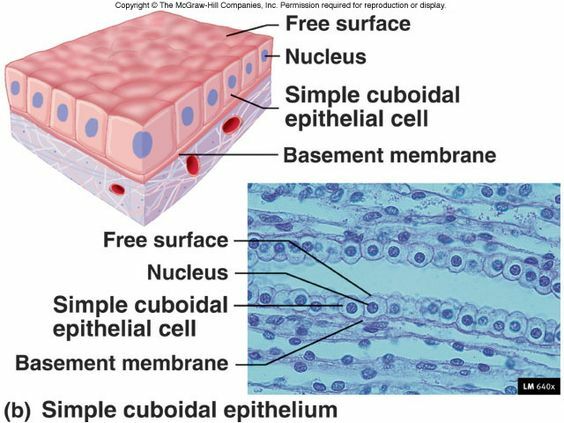 Simple Cuboidal Epithelium: As their name implies, cuboidal cells are roughly square or cuboidal in shape. Each cell has a spherical nucleus in the centre. 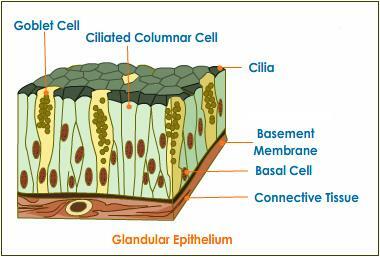 Cuboidal epithelium is found in glands and in the lining of the kidney tubules as well as in the ducts of the glands. They also constitute the germinal epithelium which produces the egg cells in the female ovary and the sperm cells in the male testes. 3. Simple Columnar Epithelium: Columnar epithelial cells occur in one or more layers. The cells are elongated and column-shaped. The nuclei are elongated and are usually located near the base of the cells. Columnar epithelium forms the lining of the stomach and intestines. Some columnar cells are specialised for sensory reception such as in the nose, ears and the taste buds of the tongue. 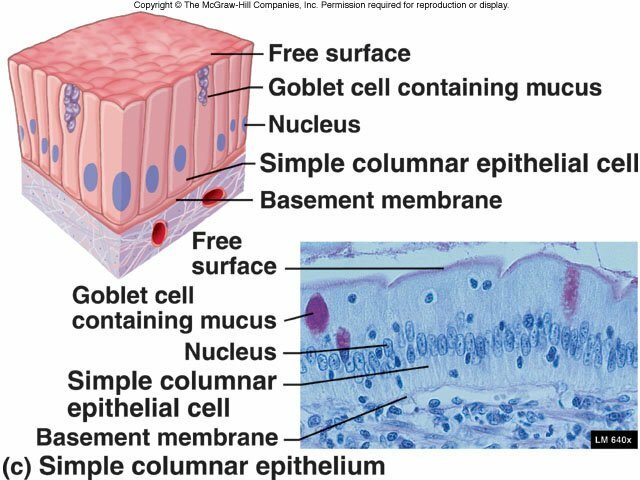 Goblet cells (unicellular glands) are found between the columnar epithelial cells of the duodenum. They secrete mucus or slime, a lubricating substance which keeps the surface smooth. 4. Ciliated Columnar Epithelium. These are simple columnar epithelial cells, but in addition, they possess fine hair-like outgrowths, cilia on their free surfaces. These cilia are capable of rapid, rhythmic, wavelike beatings in a certain direction. This movement of the cilia in a certain direction causes the mucus, which is secreted by the goblet cells, to move (flow or stream) in that direction. Ciliated epithelium is usually found in the air passages like the nose. It is also found in the uterus and Fallopian tubes of females. The movement of the cilia propels the ovum to the uterus. Glandular Epithelium: Columnar epithelium with goblet cells is called glandular epithelium. Some parts of the glandular epithelium consist of such a large number of goblet cells that there are only a few normal epithelial cells left. Columnar and cuboidal epithelial cells often become specialised as gland cells which are capable of synthesising and secreting certain substances such as enzymes, hormones, milk, mucus, sweat, wax and saliva. Unicellular glands consist of single, isolated glandular cells such as the goblet cells. Sometimes a portion of the epithelial tissue becomes invaginated and a multicellular gland is formed. Multicellular glands are composed of clusters of cells. Most glands are multicellular including the salivary glands. Where body linings have to withstand wear and tear, the epithelia are composed of several layers of cells and are then called compound or stratified epithelium. The top cells are flat and scaly and it may or may not be keratinised (i.e. containing a tough, resistant protein called keratin). The mammalian skin is an example of dry, keratinised, stratified epithelium. The lining of the mouth cavity is an example of an unkeratinisied, stratified epithelium. Protection. Epithelial cells from the skin protect underlying tissue from mechanical injury, harmful chemicals, invading bacteria and from excessive loss of water. Sensation. Sensory stimuli penetrate specialised epithelial cells. Specialised epithelial tissue containing sensory nerve endings is found in the skin, eyes, ears, nose and on the tongue. Secretion. In glands, epithelial tissue is specialised to secrete specific chemical substances such as enzymes, hormones and lubricating fluids. Absorption. Certain epithelial cells lining the small intestine absorb nutrients from the digestion of food. Excretion. Epithelial tissues in the kidney excrete waste products from the body and reabsorb needed materials from the urine. Sweat is also excreted from the body by epithelial cells in the sweat glands. Diffusion. Simple epithelium promotes the diffusion of gases, liquids and nutrients. Because they form such a thin lining, they are ideal for the diffusion of gases (eg. walls of capillaries and lungs). Cleaning. Ciliated epithelium assists in removing dust particles and foreign bodies which have entered the air passages. Reduces Friction. The smooth, tightly-interlocking, epithelial cells that line the entire circulatory system reduce friction between the blood and the walls of the blood vessels. The matrix and cells are different in different connective tissues. Matrix is the ground substance. Areolar : Most widely spread connective tissue. Fibroblasts-which forms the yellow (elastin) and white (collagen) fibres in the matrix. Macrophages-which help in engulfing bacteria and micro pathogens. Adipose tissue: It has specialized cells storing fat called adipose cells. Help in forming paddings. Fibrous: It is mainly made up of fibroblasts. It forms tendons and ligaments. Supporting Connective Tissue are two types Cartilage and Bone. Matrix is composed of chondrin. The cells lie in the matrix singly or in groups of two or four surrounded by fluid-filled spaces. The cartilage may be elastic whose matrix has yellow fibres as in pinna of ear. The cartilage may be fibrous, whose matrix has white fibres. Fibrous cartilage is present in between vertebrae. The cartilage can be calcified where matrix is deposited with calcium salts as in head of long bones. Matrix is composed of ossein. Matrix also contains salts of calcium, phosphorus and magnesium. The matrix in mammalian long bones (such as thigh bone) is arranged in concentric rings. The osteocytes (bone cells) lie on the lamellae (concentric rings in the matrix.) Osteocytes give out branched processes which join with those of the adjoining cells. Some bones have a central cavity which contains a tissue that produces blood cells. The substance contained in the bone cavity is called bone marrow. irregularly arranged. Such bones are found at the ends of the of long bones. In the compact bones, cells are arranged in circles or lamellae around a central canal- the Haversian canal. Blood and Lymph are the two forms of the fluid connective tissue. White blood cells (Leucocytes)-Function in defence against bacteria, viruses and other invaders. 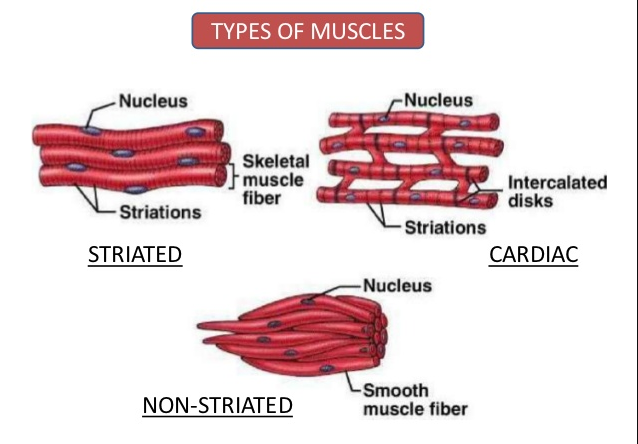 Muscle tissue is composed of long excitable cells containing parallel microfilaments of contractile proteins shape. Actin, myosin, troponin and tropomysin. Because of its elongated shape, muscle cell is called a muscle fibre. 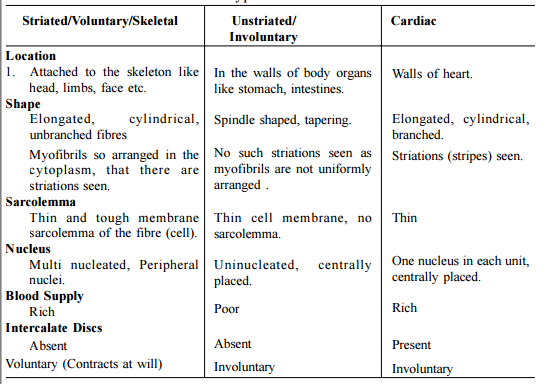 The muscle fibres of vertebrates are of three different types (i) Striated (ii) Unstriated (iii) Cardiac according to shape and functions as mentioned table. Nervous tissues have two kinds of cells i.e. neurons and neuroglia cells. Neuron is the functional unit of nervous tissue. Neurons are also called nerve cells. Nervous tissues constitute the brain, spinal cord, nerves and the sensory cells and sense organs. A single neuron has a generalised appearance as shown in Fig. Like any other cells of the body, it has the main cell body called cyton from which project out a varying number of processes –one of which is usually very long. This long fibre is called the axon. The smaller but branching processes of the cyton are called the dendrites (GK dendros = tree). The cell bounded by plasma membrane possesses a nucleus and other organelles like mitochondria etc. The smaller but branching processes of the cyton are called the dendrites (GK dendros = tree). The cell bounded by plasma membrane possesses a nucleus and other organelles like mitochondria etc. The cyton also contains dark granules called Nissel bodies. These are made of RNA. and Protein.Transmission of nerve impulse – The branching dendrites receive the stimulus. 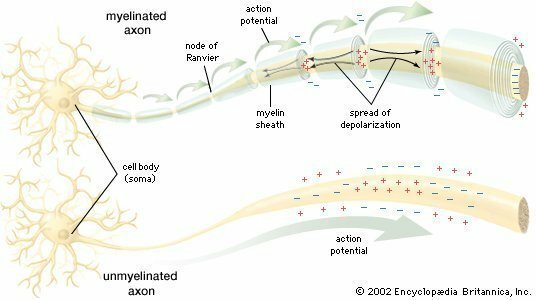 Transmission of nerve impulse – The branching dendrites receive the stimulus and transmit through the cyton to the axon, which finally transmits it through its variously branched end into either a muscle (to order it to contract) or to a gland (to order it to secrete). The axon constitutes the nerve fibre. The nerve fibre may or may not be covered by an extra sheath called medullary sheath secreted by sheath cells. It is made of myelin a lipid-like substance. Accordingly, the nerve fibre is termed medullated and non-medullated. The medullary sheath is not continuous and is broken at nodes of Ranvier.